When Tufts squash returns to the courts this winter season, the Jumbos will compete with a new coach guiding the way. 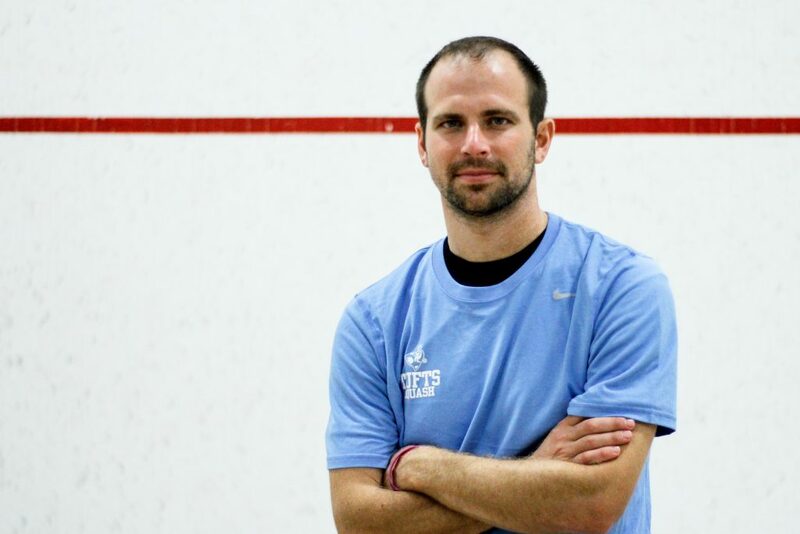 Bringing passion, ingenuity and a readily apparent sense of excitement to the sport, Joe Raho is eager to both join in on and help generate a brand-new era of men’s and women’s squash at Tufts. After former coach Joe McManus’ departure, a selection process involving both administrators and players chose Raho based largely on his past successes. As a player, Raho played on the U.S Junior National team as well as collegiately at the University of Pennsylvania. As a coach, he most recently worked as the assistant coach at Brown University. Raho satisfied his passion for the game as a player before discovering his love for coaching. Raho’s parents met playing squash and both played competitively, so squash was engrained into his DNA from birth. Growing up in Westchester, N.Y., he was ranked by the age of 16 as one of the top 10 juniors in his age bracket. Later, in the under 19 age bracket, he was again ranked in the top 10 when he was chosen as one of a group of eight to represent the United States in the World Junior Squash Championships in Pakistan. Raho went on to play at the Div. I level in college, where he describes being on the squash team as an integral part of his life at the University of Pennsylvania. Out of college, Raho worked as a paralegal before his interest in cooking created another deviation in his life path. Raho credits his parents for allowing him to pursue his passion for cooking, always remaining supportive as he tried to figure out what he wanted to do for the rest of his life. “My parents often told me I could do anything I wanted… they were really supportive of me [and] told me to pursue my passions, and the things I had loved most in the world were sports and food,” Raho said. With two Italian parents, Raho became extremely interested in how to present meals in unique ways and how to tell stories through food. Eventually, however, he realized cooking was not to be his lifelong career. Clearly, his path to coaching was neither linear nor direct, and Raho admits his dreams didn’t always point in that direction. As a result, even during his time at culinary school, Raho was taking classes at night and coaching girls squash at Greenwich Academy. After cooking for several years, Raho went to Brown and became the assistant squash coach for the university. He credits his experience at Greenwich Academy as inspiring his full time move to coaching. At Brown, Raho began to fine-tune his coaching skills. Both players and the administration seem extremely pleased with Raho’s arrival now that the selection process has concluded. Sophomore Claire Davidson agreed with Patrick’s assessment. “I think he’s just a nice, fresh face and a nice change for our program… we had a really good season last year and we’re really excited about having a new face leading us,” she said. Even though he is not permitted by NCAA regulations to begin training with the teams until Nov. 1, Raho has already thought of ways to get familiar with the Jumbos. Attention to detail and individualized care is a hallmark of Raho’s style. This manner of coaching is exciting for the players as well. The personalized approach is also vital to players who might need advice during their future matches. The team’s goals for the season also align well with Raho’s plans. In charge of both the women and men’s squads, coach Raho will have his hands full once squash season kicks into gear. No stranger to hard work or collegiate athletics, Raho seems well equipped to lead the Jumbos to new heights.